That's What She Fed: Guacamole! I used to not like guacamole. Maybe it was the texture, maybe it was my unfamiliarity with avocados. Regardless, it was just "green stuff" to me. I think I finally tried it in college, and started eating massive amounts of it when I became an adult in the "real world." This year I started making my own guacamole as an easy party appetizer, and sometimes as late night munchies (yes, TWSF makes fresh guacamole when they come home from the bars). Just this weekend, I stopped using the McCormick's Guacamole Seasoning. Why? Because I'm a a budding chef and using a seasoning packet makes me feel like I'm skipping out on some work. To be honest though, I think it's more flavorful with the packet of yummy goodness added. I'll include the packet as "optional" in the recipe, in case you like a little more spice in life and are okay with the semi-homemade stuff. This recipe makes a decent size bowl of guacamole. 1. Scoop insides of the avocados into a bowl. I find the easiest way to do this is by first cutting the avocado in half. Remove the pit and scoop out the insides with a large spoon. Mash it up!! 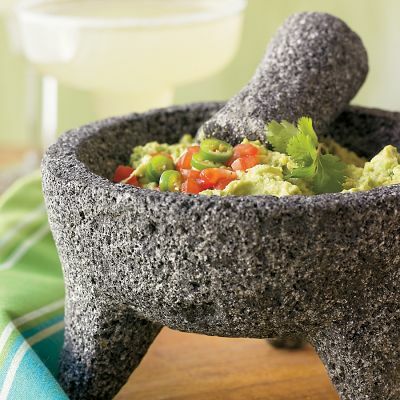 If you have a molcajete or a masher, this would be a good time to use it. 2. Stir in garlic and onion. Squeeze juice from lemon into mixture, stir, and add salt to taste. If you want to use the packet of seasoning, dump it in and stir. How easy was that? You too can make a big bowl of this when you come home from a night of dancing at McFadden's. This looks fantastic! Could I put in a request for a chili recipe? I prefer lime juice to lemon, and i must have chopped roma tomatoes.